“Ethical Practice, Quality Care,” is the theme for this year’s National Nurses’ Week, which begins on May 6, 2015. To celebrate this week, we have compiled from the Journal archives the most groundbreaking, read and cited ethics articles that address ethical issues in nursing and health care! The collection features classic ANS articles from the first 20 years – articles that remain relevant, timely and essential guides for discussion and dialog related to the pressing ethical issues of our discipline. 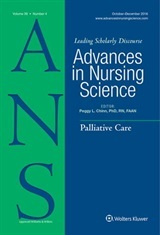 The authors of the twenty articles in the collection are among the most cited nursing scholars whose writings continue to shape ethical thought in nursing. This collection will be prominently displayed on the ANS Web site all week. But it is available now so that you can have a head start in preparing for the many discussion that will focus on ethics during the week of celebration. Click here to go to the collection.